There is no disputing that first home buyers in Australia have it tough……very tough. Housing prices in many of Australia’s cities & suburbs are currently at (or around) all time high’s (even using ratio’s such as an income to house price ratio) and the current Australian tax system is greatly skewered in favour of cashed up investors over owner occupiers. 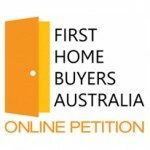 In 2015 we launched an online petition campaigning for Australia’s federal & state governments to make the system more fair for first-timers priced out of the market by tax advantaged investors. The campaign has been relaunched and is based around a 5 point plan which we believe will bring more fairness to the housing market for current and future generations. You can make a difference by showing your support today. To see our 5 point plan in full and to show your support for these changes please visit our online petition. Australian media as they attempt to raise awareness for the need for more help for first home buyers as well as share their latest tips and insights on topics that matter to fhb’s most. For many Australian's the dream of owning their own home is out of reach. But a new scheme could help first homebuyers get a piece of the pie. Spectacular sunsets over the Indian Ocean, a stroll along the sand, a morning dip in the sea - it's no wonder that people gravitate towards the coast when choosing where to live in Perth. When you cruise down West Coast Highway, passing all those spectacular million-dollar-plus properties, it's easy to think a home in a beachside suburb is out of financial reach for a first-home buyer. The government's careful 'scalpel' surgery on the housing market may not be the reason for cooling prices, experts say. Sydney prices dropped 0.72 per cent between October and November, compounding on small monthly declines since September. Many had attributed this to the Australian Prudential Regulation Authority's crackdown on mortgage lending to investors in March. Sydney's seven-figure median house price might seem sky-high, but there are still 81 suburbs where it's still possible to buy for less than $650,000, new data shows. Usually, market commentary uses the "median" price - or the middle value of all the homes that sold - but lowering this to the bottom quarter figure paints a different picture of Sydney prices. Almost half of Australian homeowners taking out mortgages are failing to ask "the No.1 question" that could save tens ofthousands of dollars on their loan repayments. In NSW, an average owner-occupier mortgage is $433,800, with interest at the standard 4.73 per cent. Sydney has surpassed another affordability milestone. There are now no suburbs with a median house price under $500,000. Five years ago, Sydney was home to 159 suburbs with median house prices of less than half a million dollars. But these have been dropping off at ever-increasing rates, Domain Group data shows. Homeownership among young Australians has fallen by more than one-third in the last 25 years. Despite an increase in Australia's disposable income, the rise in house prices has eclipsed those benefits. Australia's millions of property investors will soon have a new outlet to lobby the government, with a group set to launch aiming to protect their interests. In a draft announcement provided to Domain, the soon-to-be-formed Property Investors Council of Australia (PICA) describes themselves as a not-for-profit association run "by property investors, for the interests of property investors". The number of first-home buyers using stamp duty concessions has more than doubled after the state government introduced several savings measures nearly three months ago. More than 2100 Victorians have used first-home buyer incentives since July 1, including 1850 who paid no stamp duty when buying their first property, according to state government figures to be released on Saturday. Are 5 per cent deposits really the answer to first-home buyer woes? It's now so difficult to buy a home in Sydney that first-home buyers are buying in with as little as 5 per cent deposits - and developers are on board assisting those with meagre savings. But is the strategy worthwhile? One couple - Joe and Daissy​ Del Rio - certainly think so. First-home buyers have been at record low numbers during the property boom, but new official data reveals they're surging back into NSW and Victoria. Experts say this revival is likely the result of new first home owner grants introduced in July, but could also be thanks to young people giving up on the cities and buying in regional areas instead. LIBERAL candidates will bear the brunt of a Berejiklian government backlash in today's delayed local council elections, opening the door to independent candidates with largely unknown political views. A total of 46 NSW councils caught up in the government's botched merger policy go to the polls today, with voters expected to punish the Liberals for their slipshod handling of the process. First-home buyers looking to purchase property in Sydney or Brisbane needn't give up hope. According to Taj Singh, director and co-founder of First Home Buyers Australia (FHBA), there are still pockets that may offer an opportunity to get a footing into the market. Many assume millennials are perennial renters lured to Sydney's inner-city suburbs for the smashed avocado but new data paints a different picture of whereour 25- to 34-year-olds are living. In the past 10 years, it's suburbs in Sydney's middle-ring, to the west of the city, that have seen the biggest surge in this younger demographic, census data shows. Home ownership for Australians under 40 dropped dramatically from a third to a quarter in just four years, a new survey released on Wednesday shows. Latest figures show 31.2 per cent of 18 to 39 year olds owned a home in 2010, compared with 25.2 per cent in 2014, the Household, Income and Labour Dynamics in Australia (HILDA) Survey found. This has led to children asking their parents to "Give us the money!" as an early inheritance, sometimes creating tensions that end up seeing them cut out of wills completely, or their share slashed. After parents' death, they're also increasingly challenging siblings and other family members for a bigger slice of the pie. Families are being torn apart as more than one in four Gen Y Australians today admit they are banking on inheritance cash to be able to afford to buy homes in expensive markets. This has led to children asking their parents to "Give us the money!" The shock waves from Sydney's perpetually booming market are being felt in regional NSW, with price growth in our regional towns now outpacing the harbour city. Over the June quarter house prices in regional NSW jumped a bullish $13,000 to an all-time high of $475,000 - up $40,000 over the year. First-home buyers have heard it a million times before - if they want to buya home in Sydney they'll "have to compromise" to afford it. To achieve the new exemption on stamp duty, first-home buyers will need to purchase a home under $650,000 - and under $800,000 for a partial exemption. THE dream of home ownership is slipping away for many Australians as the latest Census results highlight the increasing number of renters. The results released today show the trend towards renting rather than owning continued, with nationwide figures showing a slight change. Property prices in affordable areas are expected to jump "overnight" on the back of changes to first-home buyer stamp duty concessions starting in July, experts say. Strategic vendors in these locations are holding off accepting offers until next month to take advantage of the expected surge in demand. The most affordable spot for Sydneysiders looking to buy their first home is so far from the city it barely counts as Sydney at all. Gosford, about a 75 kilometre drive from Sydney's centre, on the Central Coast and the cusp of the Greater Sydney, is the cheapest area for first time buyers. Could stamp duty cuts force prices up? THE STATE Government may have cut stamp duty for first home buyers - but some still want answers as to how they will afford to enter Sydney's sky-high property market. Last week, NSW Premier Gladys Berejiklian announced that stamp duty would be cut for first home buyers purchasing properties up to $650,000 and that there would also be saving for those purchasing properties up to the value of $800,000. Brisbane is being held up as an example of housing affordability, because 92 suburbs in the greater Brisbane area have a median below the average purchasing power ($392,000) of first-home buyers. Domain Group chief data scientist Nicola Powell said the outlook for Brisbane first-home buyers was good. Can you really buy a house in Sydney under $650,000? That's the question plaguing some first home buyers after the NSW Government announced it would scrap stamp duty on properties below that price as part of a bid to increase housing affordability. If you've ever thought the cost of your rent was so expensive you could afford a mortgage instead, you're not far wrong. Australian tenants pay just $62 less a week in rent than homeowners pay on an average mortgage, a new analysis of a survey and government statistics shows. For Keira and Steve Tunnah, saving for their first home was a harrowing experience. "You can still have your occasional smashed avo but you have to be really ruthless with yourself," Mrs Tunnah said. "It's just a matter of budgeting." "For us, the way we did it was live with one salary and save the rest." The government's plans to allow first home buyers to salary sacrifice up to $30,000 into superannuation accounts looks set to do little to make houses more affordable. "Under this plan, most first home savers will be able to accelerate their savings by at least 30 per cent," Treasurer Scott Morrison said in his budget speech. THE Federal Government should double the cap placed on superannuation contributions for first home deposits, according to a leading buyers' advocacy organisation. First-home buyers will be able to save up to $30,000 towards a deposit through voluntary contributions to their super accounts under measures announced in the Federal Budget. Federal Treasurer Scott Morrison has handed down his second Budget, promising that Australia's economy is "moving towards better days. "Housing is a key area for change, with the government planning to introduce a new scheme allowing first-home buyers to save money within their superannuation funds. Management accountant Taj Singh sharing his observations with Gautam Kapil. It was hoped the federal budget would offer a life raft for first-home buyers struggling in Australia's most expensive capital cities.​ But instead experts have slammed the budget as a "missed opportunity" that will do little to improve the situation for young buyers. Economists and housing sector advocates have cautioned there will be no immediate impact on Sydney's house prices, after Tuesday night's federal budget. Treasurer Scott Morrison has acknowledged "there are no silver bullets to make housing more affordable". Instead, the Treasurer has opted for a "comprehensive approach" aimed at "unlocking supply" and creating incentives for prospective buyers. Housing affordability remains one of Australia's biggest concerns heading into the federal budget on Tuesday. Despite house prices sitting at high levels across Australia's major cities, some potential home buyers remain optimistic. Despite all the huff and puff on housing, a senior economist has warned voters the government will disappoint on the one reform almost everyone wants. Professor Richard Holden said it would be a "real shame but no surprise" if Tuesday's federal budget failed to curb tax perks for property investors. Saving a deposit is the toughest challenge for first-home buyers and the federal government has promised to provide a helping hand with a new savings initiative worth $250 million. The First Home Super Saver Scheme will allow entry-level buyers to save funds at a discounted tax rate by making additional contributions to their superannuation. There are now only four Sydney suburbs where the median house price is below $500,000, new data shows. And they're all more than 45 kilometres west of the CBD. Five years ago, there were more than 150 suburbs out of 467 in Sydney that could make this claim. First-home buyers hoping to buy in NSW and Victoria need to save more than $2500 a month to have an adequate enough deposit by 2020, a new analysis shows. And even those hoping to buy in the next decade need to put away more than $500 a month in order to save a 20 per cent deposit, a Domain Group analysis of latest Australian Bureau of Statistics data shows. People saving for their first home could be given a tax break to help them get that big deposit. The Federal Government is understood to be considering the plan as part of the Budget to be handed down in 9 days. The biggest barrier for three quarters of millennials is saving a deposit to buy a home. And there is no capital city in Australia where this is more difficult than Sydney, where a 10 per cent deposit on a median priced house is more than $110,000. Amy Carlson, 33, moved to Sydney from Melbourne seven years ago. Two weeks ago, after witnessing a massive surge in property prices, she moved back - with her partner Jamie Hodgson and son Olli. The Turnbull government's housing affordability package is shaping up to be all talk and no action, keen budget observers say, as Treasurer Scott Morrison manages expectations ahead of the May budget. In a key pre-budget speech in Melbourne on Monday, Mr Morrison said the benefits of his planned measures would be realised "in some cases over a generation, not an electoral cycle, not a budget cycle". Australia is ranked among the world's worst for young home buyers, falling far below average for home ownership, a report from HSBC released on Thursday shows. After 9000 millennials were surveyed across nine countries, Australia was found to be close to the bottom of the list - only 28 per cent had bought a home. Sydney property prices grow 19%: should Aussies salary-sacrifice to buy in? Friday 31 March 2017 Article by Kelly Emmerton House prices in the Sydney and Melbourne property markets continued to swell in March, according to CoreLogic data, and now the idea of a superannuation-like scheme to help first home buyers save up a deposit may become a reality. ANY first home buyer will tell you that saving for a home deposit is the single biggest barrier to getting on the property ladder. On top of that, there's stamp duty, lenders mortgage insurance, building inspections, pest inspections; the list goes on. It's expensive to save for your first home. Mark Latham has accused politicians of all stripes of harbouring a "supply-side fetish" and has called for immigration to be slashed in an attempt to improve housing affordability in Australia. WORKERS in our most valued professions will be offered cheaper housing in new developments under a progressive new initiative being discussed by state and federal governments. In a move to address skyrocketing house prices in Sydney, key workers such as nurses, teachers and police officers will be able to access premium properties at an affordable price, to ensure they are able to afford to live where they work. Regular readers will be aware that MB supports the Sustainable Australia political party, which we believe represents an important political alternative to the status quo and the loony right, and offers sensible policies on population growth and fostering innovation, among other things. FIRST home buyers may be tempted to celebrate Victoria's decision to provide extra grants and stamp duty concessions, but they probably shouldn't. AMP chief economist Shane Oliver is just one of the experts left puzzled over the Victorian Government's latest move to help first home buyers. First home buyer advocates are pushing for Victoria's new shared ownership scheme to be expanded nationally. From January 2018, 400 lucky Victorian singles or couples will be able to split the price of a new home with the state government. House prices have risen so fast in Sydney that just four suburbs are still within reach for first-home buyers. Not surprisingly, they are all more than 45 kilometres away from the CBD. Just a small cluster of suburbs in Sydney's west - Willmot, Tregear, Emerton and Lethbridge Park - had a median price that was on par with the typical amount spent on a property by first-home buyers. Australians are more pessimistic about the future of housing affordability and living costs than any other lifestyle factor in the next 10 years, a new report shows. And experts warn the growing cost of housing in capital cities is having a knock-on effect onto business confidence. Well, it's certainly one of the more creative solutions to the country's housing affordability crisis. Federal Nationals MP Andrew Broad has suggested banks should forgo a deposit from first homebuyers who have a strong three-year rental history - meaning they can borrow 100 per cent of the loan. Liberal MP John Alexander, who is leading a backbench push for action on housing affordability, has urged the government not to abandon the "frustratingly obvious" reform of curbing overly-generous landlord tax perks. The property market has become so expensive that nine out of 10 Australians are despairing about their prospects of achieving the 'Great Australian Dream', new data shows. A white paper from Mortgage Choice in conjunction with research firm Core Data, The Evolving Great Australian Dream, surveyed 1000 Australians to find out whether attitudes towards home ownership were shifting. A rise in first-home buyers 'rentvesting' - buying an investment property while continuing to rent - to get a foot on the property ladder is simply creating a bigger affordability issue for the next generation to deal with, experts warn. A global survey highlights the miserable lot faced by Gen Ys living Down Under. A new study has found that millennials in this country are significantly more pessimistic about their financial and emotional wellbeing than their global counterparts. The 2017 Deloitte Millennial Survey, released on Wednesday, reveals that just 8 per cent of our Gen Ys believe they will better off than their parents - and only 4 per cent expect to be happier. Queensland Treasurer Curtis Pitt has come under fire from the Real Estate Institute of Queensland for knocking back its proposal to expand the first home owners' grant to existing properties, as opposed to only new homes. Read the Latest Real Estate & Property Market News from Australia on Domain.com.au. Single home buyers have declined significantly in the past two years and experts warn those who aren't in a relationship will find property "out of reach". An analysis of 40,000 home loan applications by lender ME found a drop of almost 10 per cent in applications from single applicants in the two years to 2016. BOOMING home prices have added two years to the time it takes most first-time buyers to save deposits. And the upfront costs of buying have risen by $27,000 in just a year. More than 60 per cent of the state's first home buyers who purchased in 2016 required more than three years to save a deposit. A new report from Bankwest shows that the average Australian couple spent 4.4 years saving up for a 20 per cent deposit to buy a median-priced house in 2016. This is an extra two months on last year. First homebuyers in NSW have it the toughest, having to scrimp and save for an average of 5.7 years to save a $138,600 deposit. Jordan Burr-Marshand his girlfriend have a four-month old child and want to buy a house in Sydney's west. They're saving 20 per cent of their income and paying rent at the same time to try and make their home ownership dreams come true. Real estate industry figures have criticised NSW Planning Minister Rob Stokes' request for the federal government to make changes to negative gearing. They say there is a more effective housing lever that could pulled to improve affordability - stamp duty. At an age when most Australians are thinking about their next Friday night out, Robert Marsden Petty is thinking about his next investment property. The young property gun is currently awaiting settlement on his third property, an apartment in Townsville, and he's just 20 years old. There is now just one suburb in Melbourne that a moneyed-up first home buyer could still afford if they wanted to live within 10 kilometres of the city. Welcome to Braybrook: the last bastion of affordability in the inner ring for those sold on a house as their first purchase. How can Gen Y actually get into a home? Posted October 20, 2016 07:03:11 So you've fallen into the generation where housing is unaffordable, education is not free and health cover costs more than you really want to think about. And you can't even eat a slice of smashed avocado on toast without some Baby Boomer telling you that's why you're locked out of the housing market. LOCAL first home buyers hunting for value are flocking to house-and-land package-type developments in the Penrith region. With young buyers still aspiring to own a house with a backyard, a house-and-land package purchase less than $750,000 can qualify a first homebuyer for the NSW Government's First Home Owner Grant, while $550,000 is the threshold for stamp duty exemption. By Michael Mata | 14 Oct 2016 Font size : The nation's Treasurer, Scott Morrison, recently came under fire in an interview at the International Monetary Fund's headquarters in Washington, D.C. when he said there was "no evidence" the Australian property market was overvalued outside "arguably some pockets if x and y and z happened, and x and y and z [have] not happened." These are the words of our Treasurer Scott Morrison, who said in an interview at the International Monetary Fund's headquarters in Washington there was "no evidence" the property market was overvalued outside "arguably some pockets if x and y and z happened, and x and y and z has not happened." If you're single, on an average income and looking to buy a home, your dream is likely unattainable in six of Australia's capital cities, a new analysis shows. Just Hobart and Adelaide allow an average income earner to buy a median-priced house alone, a measurement of official house price data and mortgage costs by comparison website RateCity found. This depressing chart sums up why the Australian dream is out of reach. An analysis of house price and household income by a former Reserve Bank economist reveals that the gap between the two has never been higher. Callam Pickering, the managing director and chief economist at CP Economics, looked at gross disposable income per household, adjusted to remove rental income to reflect the circumstances of the typical first homebuyer - a couple with combined annual earnings of $107,000. If you saved 40 per cent of your income from today, it would take until 2021 to purchase your first home, new data shows. And that's provided property prices don't rise, rents don't increase, and you maintain an $80,000 salary. We know this because each week there is yet another statistic, survey or policy release that confirms how out of reach home ownership is for young Australians. The latest? Corelogic data for August revealed Sydney prices rose 1.5 per cent, while Melbourne went up 1.4 in four weeks alone, putting paid to the notion that two of Australia's most expensive property markets are coming off the boil. They're cashed up, grey-haired and coming to an auction near you. IT WAS one of his most controversial remarks of the election campaign, but it turns out Malcolm Turnbull was onto something. When the prime-minister-to-be suggested broadcaster Jon Faine was wealthy enough to "shell out" for his kids to break into the property market, it sparked a wave of criticism from ordinary Australians. When you imagine a first-home buyer, they tend to be in their late-20s, buying an entry-level home that will be their launch pad to trading up. But some first-time home owners are buying more expensive homes later in life, looking for a property more akin to their dream home than someone's typical first house. Australian Broker investigates the dwindling number of young first home buyers and whether Generation Y do, in fact, have it harder than any generation before them. Generation Y - or 'Generation Selfish' - only have themselves to blame for their inability to purchase their first home. When it comes to purchasing a first home, mortgage brokers are the most trusted professional by consumers, a new survey has revealed. A national first home buyers survey conducted by First Home Buyers Australia (FHBA) shows that more than a third (38%) of first home buyers found mortgage brokers "the most useful" service provider. The average median price for apartments in Sydney is now $520 per week. (AAP) High-rise apartments in Sydney are now some of the most expensive to rent in Australia, according to a new report. Weekly rent for harbour city apartments has risen by five percent, new data from Domain Group's Rental Market report shows. Record high-rise building in Sydney has yet to provide any relief for renters, with apartment rents jumping sharply in the June quarter, data shows. The median weekly advertised rent for an apartment in the harbour city is now $520 a week, just $5 cheaper than houses, according to Domain Group's Rental Market Report released on Thursday. Noise, not location, is now the most important factor for first home buyers looking at apartments, according to strata leaders. Loud parties, barking dogs, flushing toilets and excessively vocal "intimate time", were named as the most complained about issues for strata residents by Queensland body corporate managers, Archers the Strata Professionals. Is it finally a buyer's market? Feedback to First Home Buyers Australia found the biggest problems people were facing when buying their first home were unaffordable housing (51 per cent) and saving for a deposit (32 per cent). First Home Buyers Australia believes first home buyers purchasing new properties in any state should not have to pay any stamp duty, while those buying existing property should get a 50 per cent discount. Do first home buyers still need a leg up? First Home Buyers Australia co-founder Taj Singh said with NSW (especially Sydney) being an attractive investment destination for foreign buyers, the increase in stamp duty and annual land tax for foreign investors is definitely “welcome news for first home buyers across NSW”. Fellow FHBA co-founder Daniel Cohen said while he welcomed the news, he would like to see more done to support first home buyers. “NSW is home to the highest property prices in our country, yet our grant for first home buyers is among the lowest, with little other support on offer for struggling first home buyers,” he said. First Home Buyers Australia co-founder Daniel Cohen said it was a “win” for struggling first home buyers. “Although there are concerns when grants go up that developers will increase their prices, but we don’t think that will happen here,” Mr Cohen said. A young Punjabi boy Taj Singh has started a new initiative to help first home buyers by providing them state of the art tools, calculators, checkpoint and all the latest news through their website i.e. WWW.FHBA.com.au Taj and one of his friends who have financial experience of more than 15 years provides 30 mins free sessions to anyone with specific queries. Taj Singh, co-founder and director of First Home Buyers Australia (FHBA), says that first homebuyers represent an ever-decreasing share of the property market, sliding from 21% in early 2012 to less than 15% in 2016. He has suggested a number of reforms to help create a fairer tax system for homeowners, investors and renters alike. New analysis shows the average loan for a first-home buyer has increased by 50 per cent in the last 10 years, with one state recording a 66 per cent increase. A website set up to help aspiring property owners, First Home Buyers Australia, analysed Australian Bureau of Statistics data and found the amount people were borrowing to buy their first home had increased dramatically. Taj Singh said FHBA analysis showed the increase in loan size far outstripped the rate of inflation. First Home Buyers Australia co-founder Daniel Cohen said there was more new housing stock – able to be used with a first home owners’ grant – in Victoria. Although there was also a lot of stock in Brisbane, there was a greater variety and quantity of employment opportunities for younger Australians in Melbourne, he said. “The hardest part between now and the 1980s is the deposit savings, and that’s the part that our clients complain about the most,” he said. THEY were once a kind of "gateway" real estate - the cheap option on the property ladder. But today's units just aren't what they used to be. As a result, first-home buyers in major cities are being left without a stepping stone towards the dream of home ownership. Daniel Cohen of First Home Buyers Australia says modern day unit developments, that are a far cry from the old red brick walk ups, are cutting first-time purchasers out of the game. It's flat out not fair, what's happened to the humble unit? Thought you couldn't find a decent property for under $300,000? Founder of First Home Buyers’ Australia advisory group Taj Singh suggested looking at the Western Australian towns of Rockingham and Mandurah (50km and 70km south of Perth respectively), which offer “great lifestyle choices”. Both Mr Singh and Mr Koulizos recommend searching in large regional centres where capital growth is more likely. Rebecca’s approach of moving back in with family “may not be appealing to all potential first home buyers” but offers the possibility of huge savings if you can avoid paying rent, First Home Buyers Australia (FHBA) founder Daniel Cohen said. “Be patient, set yourself a budget and an automated savings plan,” Mr Cohen said. Turnbull has been savaged over his comments that parents should "shell out" for kids' homes, but many already are. A growing number of parents are giving their children a leg up on the property ladder as house prices continue to rise across Australia. First Home Buyers Australia co-founder Daniel Cohen says parents could give their children a loan under a family financial agreement. Parents may agree to loan them $20,000 and set out in a legal contract how they would like to be repaid and other terms such as a deadline, he says. “We knew they weren’t going to say anything to the issue of housing affordability and first-home buyers,” Mr Cohen said. In an open letter from FHBA to Prime Minister Malcolm Turnbull published in April they asked why first-home buyers were being ignored. “Leaving negative gearing as it is, because it’s just what we are use to, is just plain lazy and ignorant,” the letter said. First Home Buyers Australia co-founder Daniel Cohen said saving a deposit and the associated purchasing costs is the main issue for younger home buyers. The recent declines in Sydney’s median price and a slowing market “will definitely help more first-home buyers get their foot into the door,” Mr Cohen said. Taj Singh recently took ­advantage of the weakening market by negotiating a $40 discount off the weekly rent of a new Baulkham Hills flat. “I knew there had been a lot of new developments nearby and that market rent had fallen a bit in the area, so it was getting harder for landlords,” Mr Singh said. First Home Buyers Australia co-founder Taj Singh said $400,000 was the average amount they had seen first home buyers spending, requiring an $80,000 deposit and costs. This expense has seen “more and more first home buyers choosing to buy their first home [rentvesting] as an investor in places such as Melbourne CBD, the outer suburbs of Melbourne and South East Queensland”. But in some areas apartment rents are actually slipping, providing renters an opportunity to save money. First Home Buyers of Australia co-founder Taj Singh, 26, recently moved from a Castle Hill house to a newly-built apartment in Baulkham Hills. Can single home buyers make co-purchasing work? According to Daniel Cohen, co-founder of First Home Buyers Australia, co-purchasing is an increasing trend, particularly among first home buyers. “We believe there are two key drivers behind the increase in co-purchasing. Firstly, housing affordability. “It’s not fair and it’s not enough, in short. And the reason we say that is because it’s never been more expensive to get into the property market,” said Daniel Cohen, co-founder of First Home Buyers Australia. First Home Buyers Australia has also criticised the proposal, pointing out that investor demand for properties will shoot up right before any reforms are passed, causing a spike in prices.. “It would have been a better outcome if negative gearing was wound back equally across both established and new properties,” Mr Singh said. First Home Buyers Australia co-founder Daniel Cohen, says many young Australians who moved out in their early 20s were finding it expensive to rent in their desired locations, and deciding to move back home to live with their parents to save a deposit. With house prices at record highs in some parts of Australia, would-be homeowners should be wise to “avoid borrowing too much for their first home,” says Taj Singh, director and co-founder of First Home Buyers Australia. Some general tips for first home buyers to consider when negotiating for your first home. This blog was written by the two co-founders of First Home Buyers Australia (FHBA), Taj Singh and Daniel Cohen. Is it better to buy an established home or off-the-plan property? Taj Singh: For first home buyers, buying off the plan may be a more attractive choice as all states (except for Tasmania from January 1, 2016) provide grants on new homes only (up to a certain purchase price). Buying a new property has the advantage of lower maintenance costs than an established home. Is this the dream for first home buyers? Taj Singh, co-founder of newly-founded home ownership lobby group First Home Buyers Australia said it would be critical that the region is connected to the rest of Sydney with strong infrastructure, as well as local employment opportunities. Now, First Home Buyers Australia will take up the cause of the Australian dream for those to whom it has become a distant fantasy. Sydneysiders and high school buddies Daniel Cohen and Taj Singh, both 25, set up the organisation two months ago and launched a petition calling on federal and state governments to fix housing affordability for first home buyers. The pair have come up with a five-point plan that governments could do to help people into the property market, including reducing interest costs deductibility for investors and stamp duty discounts for first home buyers. Are you giving up hope on ever buying a home? “First home buyers are the ones that need help. They can’t get into the market. I don’t think there are many people in Sydney who are buying a house under the age of 21,” Mr Cohen said. What do tenants really want in rental homes in 2016? Daniel Cohen, Co-Founder of First Home Buyers Australia also spends a lot of his time helping first-time renters enter the property market. Asked for his thoughts on the rental scene over the next 12 months, he says “call it the same old same old, but we believe it is all about the location”. Daniel Cohen, Co-founder and Director of First Home Buyers Australia agrees that while it is possible to start approaching lenders with only a 5% deposit plus costs saved, it is preferable to wait until you have more saved dollars amassed. If you are building or renovating it pays to consider what buyers are looking for. Daniel Cohen, co-founder of First Home Buyers Australia says buyers want to live in a neighbourhood that’s close to shops, close to where they work and study, and close to family and friends.